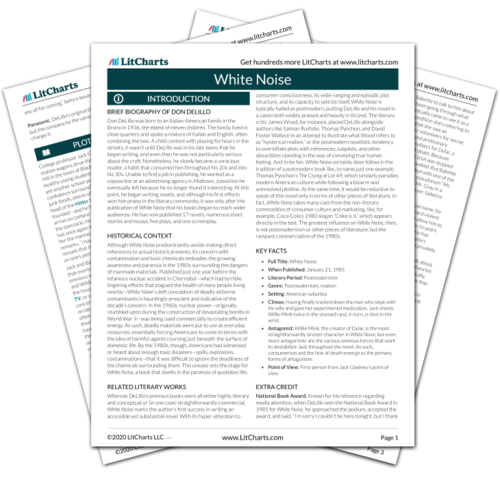 Instant downloads of all 946 LitChart PDFs (including White Noise). 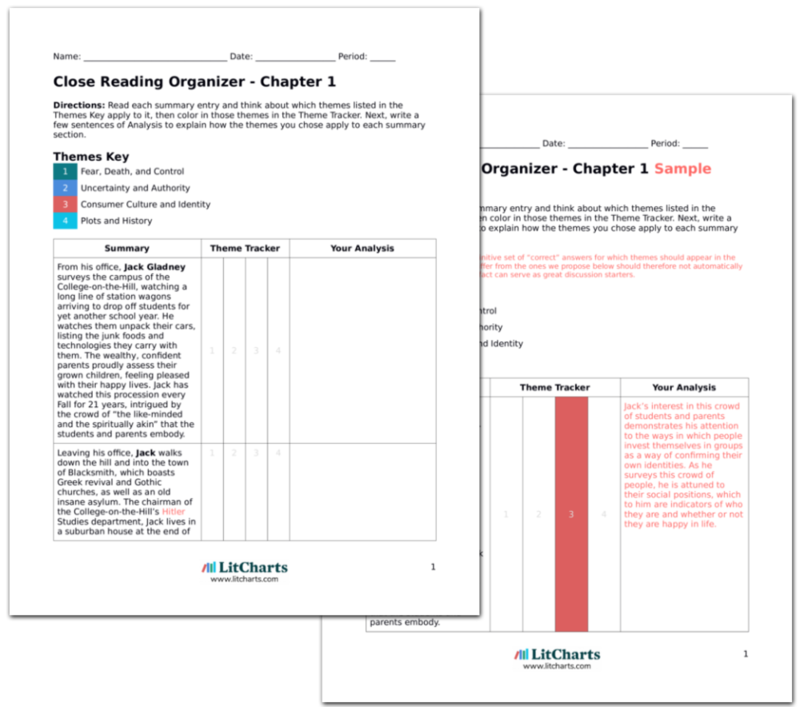 LitCharts assigns a color and icon to each theme in White Noise, which you can use to track the themes throughout the work. Time passes. Jack and Babette continue to check in with one another. The family indulges an epic fried chicken binge, sitting in the car and silently gorging in the parking lot. The Gladneys’ eating patterns display a certain solitude. This parking lot fried chicken binge is a markedly 20th century meal, one completely removed from the communal aspect of the traditional dinner table, where everybody faces each other and converses. In this moment—and every Friday when they watch TV over dinner—eating becomes nothing more than a non-communicative feeding frenzy, producing a solitude not unlike the loneliness Jack feels after the family has spent the day furiously shopping at the mall. Lannamann, Taylor. "White Noise Chapter 31." LitCharts. LitCharts LLC, 11 Sep 2017. Web. 25 Apr 2019. Lannamann, Taylor. "White Noise Chapter 31." LitCharts LLC, September 11, 2017. Retrieved April 25, 2019. https://www.litcharts.com/lit/white-noise/chapter-31.